I first heard of Max Cleland when he was profiled on 60 Minutes playing basketball. He is a triple amputee veteran of the Viet Nam war. He was director of the Veteran's Affairs Department. Later he was Secretary of State of Georgia and then U. S. Senator. He came to Tallahassee to campaign for Pete Peterson for Congress. Pete was held captive for 6 1/2 years in Viet Nam. He served in Congress and later served as Ambassador to Viet Nam and married a Viet Namese girl. Any way, Max is posed at the Florida Viet Nam Memorial in Tallahassee. Max has an amazing ability to keep people from focusing on his missing limbs and I didn't want to pose him as an amputee. 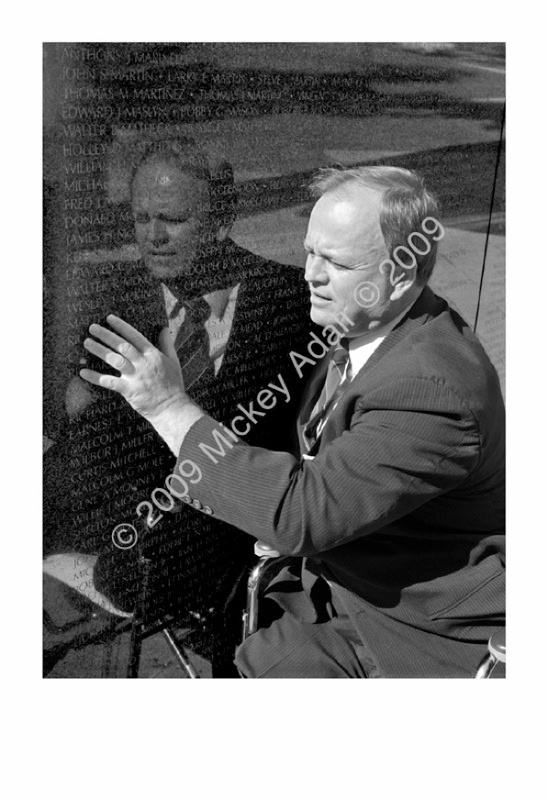 But I did allow that fact to be reflected in the wall of names of his fellow soldiers that didn't make it back from Viet Nam.